My reading of "Chile Tales: The Green Addiction, at Vroman's Bookstore in Pasadena, California, went very well. People laughed in all the right places. I didn't panic, thanks to drugs (Enderol). I looked good. Readers left to right: Nancy Ellis Taylor and Penelope Moffett are the tall poets in back. In front: Marie Unini, Janie Fried, Lisa Swanstrom, S. Ramos O'Briant, Julia Gibson. 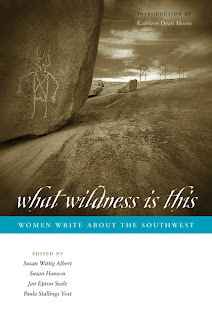 The piece is in the anthology, "What Wildness Is This: Women Write the Southwest," published in May by the University of Texas Press. We had around 70 people there. I felt like a rock star, especially when Janet Fitch (White Oleander; Paint it Black)stopped by, which I take as a good omen. Ran into her at my first reading two years ago at Skylight Books in Los Felix. That one was for a short story which appeared in "Best Lesbian Love Stories of 2004." Note the emphasis on love, not erotica. As with most of my writing, there's a touch of humor along with a touch or two. I also ran into her at the Los Angeles Festival of Books. She sat behind me in the audience for the panel on writing dark, or maybe it was writing funny, but what's the difference? 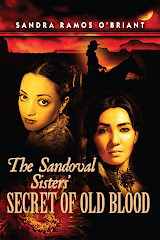 We talked about what we are working on --- both of our new novels are set in L.A. I felt very literary. I also impressed myself with actually putting together a face with a name, and even the books the person wrote.